Brigadier-General Joseph Bailey, c. 1865 (public domain). Acting Engineer Officer Nineteenth Army Corps. Semmesport [sic], La., May 17, 1864. Assistant Adjutant-General, 19th Army Corps. 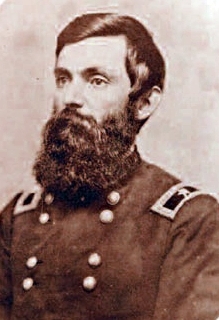 MAJOR: I have the honor to make the following report in reference to the construction of the dam across Red River, at the foot of the Alexandria falls, for the purpose of releasing that portion of Admiral Porter’s Mississippi Squadron which was unable to pass the falls, owing to the low stage of the water. Immediately after our army received a check at Sabine Cross-Roads and the retreat commenced I learned through reliable sources that the Red River was rapidly falling. I became assured that by the time the fleet could reach Alexandria there would not be sufficient water to float the gun-boats over the falls. It was evident, therefore, that they were in imminent danger. Believing, as I did, that their capture or destruction would involve the destruction of our army, the blockade of the Mississippi, and even greater disasters to our cause, I proposed to Major-General Franklin on the 9th of April, previous to the battle of Pleasant Hill, to increase the depth of water by means of a dam, and submitted to him my plan of the same. In the course of the conversation he expressed a favorable opinion of it. During the halt of the army at Grand Ecore on the 17th of April, General Franklin, having heard that the iron-clad gun-boat East-port had struck a snag on the preceding day and sunk at a point 9 miles below, gave me a letter of introduction to Admiral Porter and directed me to do all in my power to assist in raising the Eastport, and to communicate to the admiral my plan of constructing a dam to relieve the fleet, with his belief in its practicability; also that he thought it advisable that the admiral should at once confer with General Banks and urge him to make the necessary preparations, send for tools, &c. Nothing further was done until after our arrival at Alexandria. On the 26th, the admiral reached the head of the falls. I examined the river and submitted additional details of the proposed dam. General Franklin approved of them and directed me to see the admiral and again urge upon him the necessity of prevailing upon General Banks to order the work to be commenced immediately. There was no doubt that the entire fleet then above the rapids would be lost unless the plan of raising the water by a dam was adopted and put into execution with all possible vigor. I represented that General Franklin had full confidence in the success of the undertaking, and that the admiral might rely upon him for all the assistance in his power. The only preliminary required was an order from General Banks. On the 29th, by order of General Franklin, I consulted with Generals Banks and Hunter, and explained to them the proposed plan in detail. The latter remarked that, although he had little confidence in its feasibility, he nevertheless thought it better to try the experiment, especially as General Franklin, who is an engineer, advised it. Upon this General Banks issued the necessary order for details, teams, &c., and I commenced the work on the morning of the 30th. I presume it is sufficient in this report to say that the dam was constructed entirely on the plan first given to General Franklin, and approved by him. During the first few days I had some difficulty in procuring details, &c., but the officers and men soon gained confidence and labored faithfully. The work progressed rapidly, without accident or interruption, except the breaking away of two coal barges which formed part of the dam. This afterward proved beneficial. In addition to the dam at the foot of the falls, I constructed two wing-dams on each side of the river at the head of the falls. The width of the river at the point where the dam was built is 758 feet, and the depth of the water from 4 to 6 feet. The current is very rapid, running about 10 miles per hour. The increase of depth by the main dam was 5 feet 4 inches; by the wing-dams, 1 foot 2 inches; total, 6 feet 6 inches. On the completion of the dam, we had the gratification of seeing the entire fleet pass over the rapids to a place of safety below, and we found ample reward for our labors in witnessing their result. The army and navy were relieved from a painful suspense, and eight valuable gun-boats saved from destruction. The cheers of the masses assembled on the shore when the boats passed down attested their joy and renewed confidence. To Major-General Franklin, who, previous to the commencement of the work, was the only supporter of my proposition to save the fleet by means of a dam, and whose persevering efforts caused its adoption, I desire to return my grateful thanks. I trust the country will join with the Army of the Gulf and the Mississippi Squadron in awarding to him due praise for his earnest and intelligent efforts in their behalf. Major-General Banks promptly issued all necessary orders and assisted me by his constant presence and co-operation. General Dwight, his chief of staff, Colonel Wilson and Lieutenant Sargent, aides-de-camp, also rendered valuable assistance by their personal attention to our wants. Admiral Porter furnished a detail from his ships’ crews, under command of an excellent officer, Captain Langthorne, of the Mound City. All his officers and men were constantly present, and to their extraordinary exertions and to the well-known energy and ability of the admiral much of the success of the undertaking is due. I am also under many obligations to Major Sentell, provost-marshal, and Lieutenant Williamson, ordnance officer, of General Franklin’s staff; to Lieut. Col. W. B. Kinsey, One hundred and sixty-first New York Volunteers; to Lieut. Col. U. B. Pearsall, Ninety-ninth U.S. Colored Infantry, who was my assistant; to Capt. George W. Stein, Sixteenth Ohio, and to Captains Harding, Morrison, and Harper, of the Ninety-ninth U.S. Colored Infantry, all of whom exhibited much practical knowledge and untiring zeal. The following is a list of the troops who constructed the dam: Pioneer corps of the Thirteenth Army Corps, under Captain Hutchens, Twenty-fourth Indiana Volunteers, Lieutenant Smout, Twenty-third Wisconsin Volunteers, and Lieutenant Kimbley, Twenty-fourth Indiana Volunteers; Twenty-ninth Maine Volunteers, Lieutenant-Colonel Emerson; Ninety-ninth U.S. Colored Infantry, Lieutenant-Colonel Pearsall; Ninety-seventh U.S. Colored Infantry, Col. G. D. Robinson; and detachments from the Twenty-third and Twenty-ninth Wisconsin Volunteers, Twenty-seventh Indiana Volunteers, Nineteenth Kentucky Volunteers, Sixteenth and Twenty-third Ohio Volunteers, Twenty-fourth Iowa Volunteers, Seventy-seventh and One hundred and thirtieth Illinois Volunteers, and from other regiments. These details labored patiently and enthusiastically by day and night, standing waist deep in the water, under a broiling sun. Their reward is the consciousness of having performed their duty as true soldiers, and they deserve the gratitude of their countrymen. Lieut. Cot. and Actg..Mil. Eng. 19th Army Corps. Source: Bailey, Joseph. Report on the construction of the dam across the Red River, in Report of the Joint Committee on the Conduct of the War, at the Second Session Thirty-Eighth Congress, Red River Expedition, Fort Fisher Expedition, Heavy Ordnance. Washington: Government Printing Office, 1865.